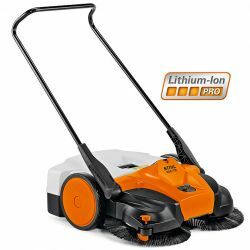 Easy and effortless to push due to the battery operation of the circular brushes and power sweep. This enables thorough cleaning of edges and corners, even when the machine is stationary. Battery sweeping machines for large areas - the STIHL MultiClean PLUS sweeping system has 8-fold central height adjustment, lateral guide roller, transport handle, stores upright to save space, ergonomically shaped 2-fold height-adjustable push bar. Sweeping was never so easy!